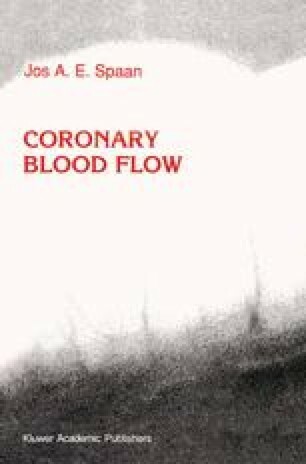 Coronary flow is controlled by the myocardium at the tissue level. This local control can be characterized by two manifestations: the adaptation of blood flow to the level of oxygen consumption and the relative independence of blood flow from coronary arterial pressure. The former manifestation is referred to as flow adaptation to metabolism, the latter one as autoregulation. Alternative terms for flow adaptation to metabolism found in the literature are metabolic regulation and functional hyperemia. However, autoregulation may also be mediated by metabolic processes and therefore metabolic regulation is an ambiguous term. Hyperemia means ‘increased blood flow’ and consequently hyperemia implies the definition of a standard control value of flow. The term flow adaptation to metabolism, or simply flow adaptation, expresses the ability of the coronary system to adapt flow to metabolic needs of the heart, and is the term further used here.